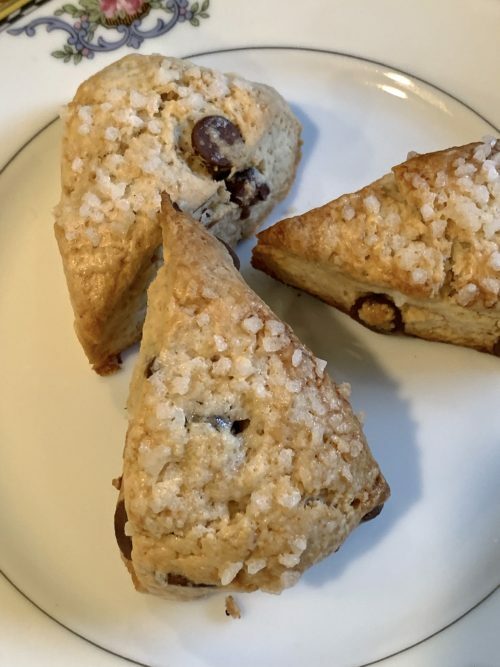 There is a correct way to eat a scone you know, and I’ve probably mentioned it before; you don’t put it all back together like a sandwich. You either split it and eat each half all loaded up or you break off small bites and add the cream and jam to each bite. And, never, ever hold your pinkie out while drinking your tea. According to the QUEEN the jam comes first and then topped with the cream; but her neighbors in Devonshire put the cream on first then the jam. How ever you put your cream and jam on, it will be delicious. 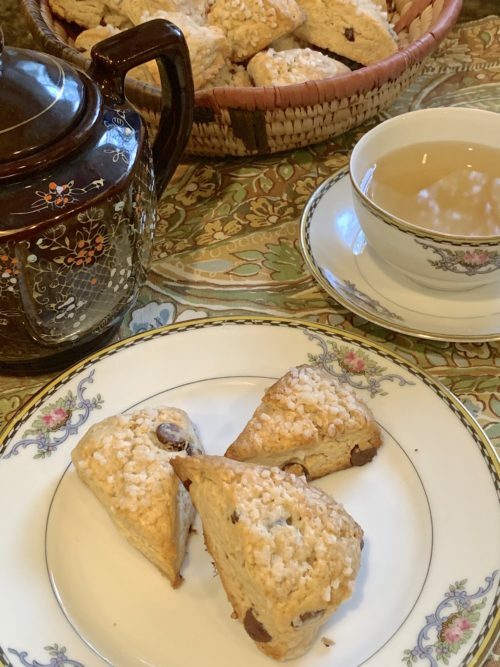 a cream tea is served after 4:00 and served with scones, jam and clotted cream dates back to the 11th century in the UK. A cream tea is a form of afternoon tea consisting or tea, scones, clotted cream (or Devonshire) and jam. An afternoon tea would serve the scones along with some desserts and little sandwiches/savories. Even though most people think of an afternoon tea as “high tea” it is not. A high tea is more like a meal for the working class family and consisted of hearty dishes with meats, potatoes, beans etc. 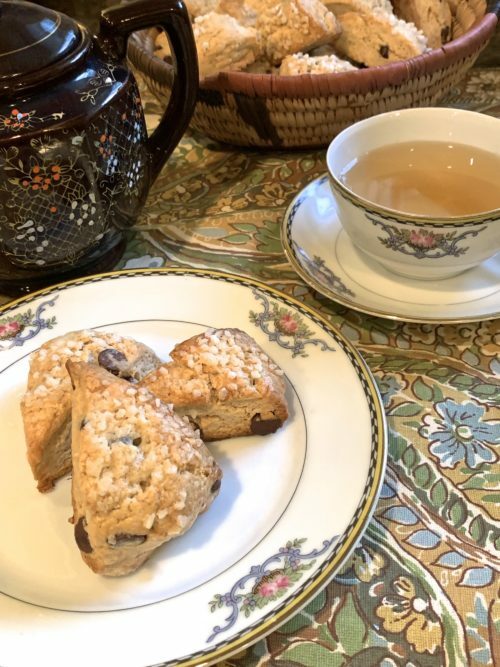 So, you see, you don’t have to have a full on afternoon tea with sandwiches and savories and desserts in order to have your scones; just have cream tea after 4 and who says you have to wait until after four; have it whenever you want. 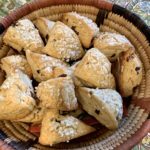 BLAST FROM THE PAST: These Walnut Lavender Scones will go nicely with your pot of tea anytime of the day. 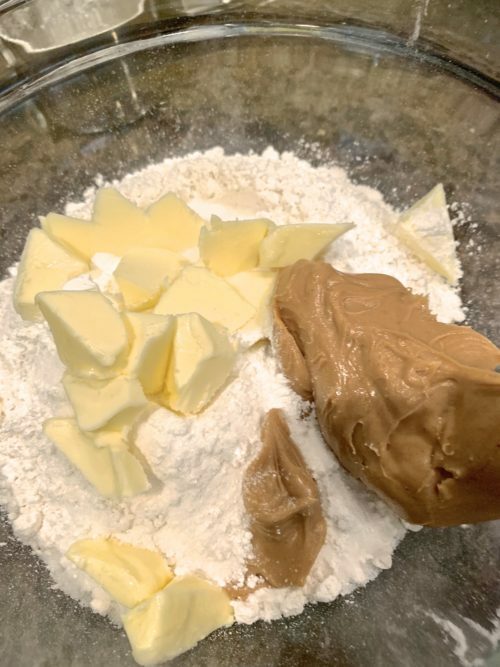 Put the cold butter and peanut butter into the flour. 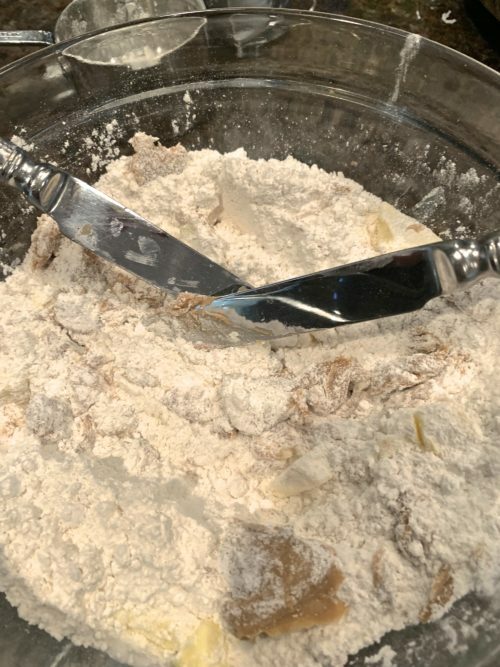 Using two knives or a pastry blender cut the butters into the flour until you have pea size pieces. Form into a circle and cut into 8 wedges. When I took these to craft circle I cut into mini wedges. Brush with some cream and top with sugar. I couldn’t find my turbinado sugar the day I made these so I used my hail (pearl) sugar. Now, make that pot of tea. Preheat oven to 425°.Line 2 rimmed baking sheets with parchment paper. 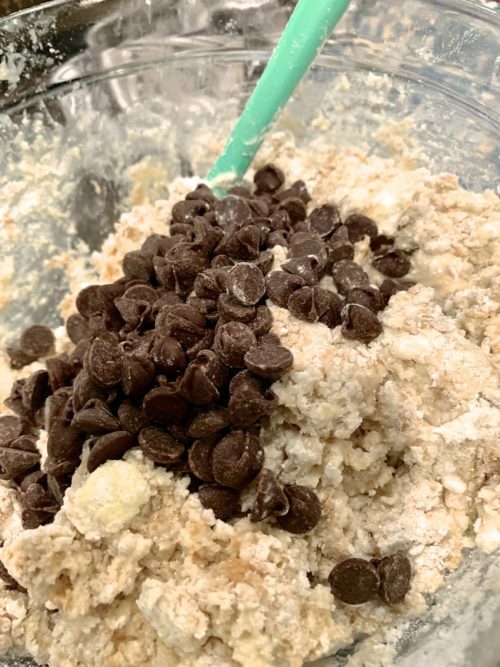 Set aside.In a large bowl, combine flour, sugar, baking powder, and salt, whisking well. Working gently, bring mixture together with hands until a dough forms.Turn out dough onto a lightly floured surface. Knead gently 4 to 5 times. 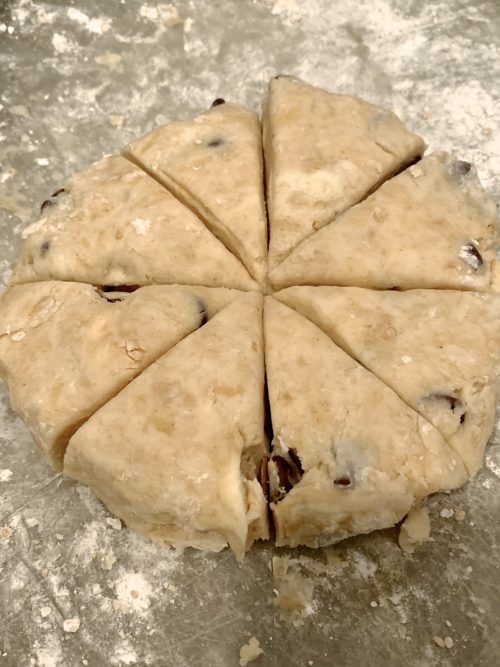 Using a rolling pin, roll dough to a ½-inch thickness. Use a 2½-inch triangular cutter, cut 19 shapes from dough, rerolling scraps as necessary. 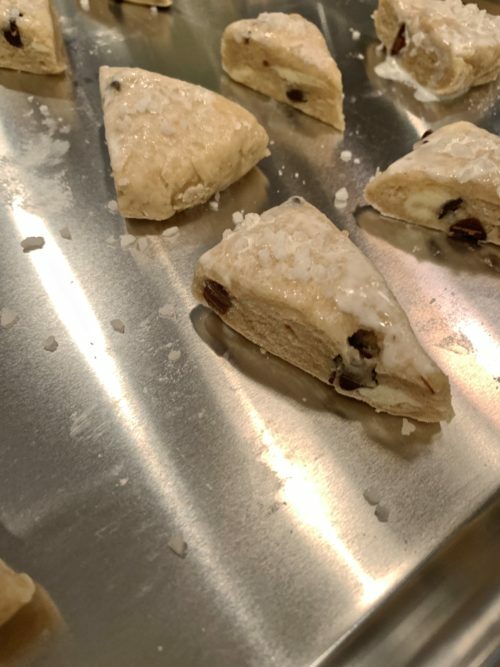 Place scones 2 inches apart on prepared baking sheets. 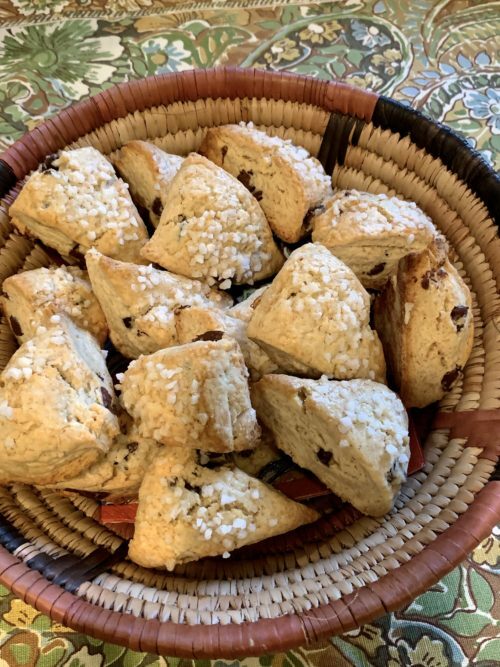 Brush with remaining 1 tablespoon cream.Garnish tops of scones with a sprinkle of turbinado sugar, if desired.Bake until edges are golden brown and a wooden pick inserted in the centers comes out clean, approximately 15- 20 minutes.